A pair of louisa harding fingerless gloves in kimono angora - I have already finished one! Another cross-over shrug - in black. 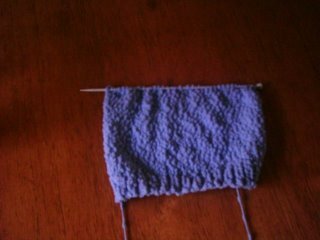 Started on 9mm needles but it was too big so I have started again on 8mm -only done about 6 rows. The Wow boa from Simply Knitting issue 9. This has grown really quickly, only a few more cm to go. I have also made a start on the Rogue Aran Pullover. One day late and I have finally finished knitting this jacket. It's not quite complete as I still need to buy some buttons. 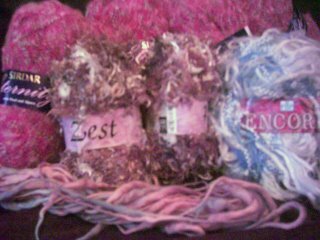 Finished the actual knitting bit yesterday but only completed the sewing up today. I think I prefer having lots of projects on the go rather than having a deadline for one. I can now start on my 'Rogue' aran, just need to find out how to do a temporary cast on. I also had a great time at the show, although I did expect to see more knitting stands. 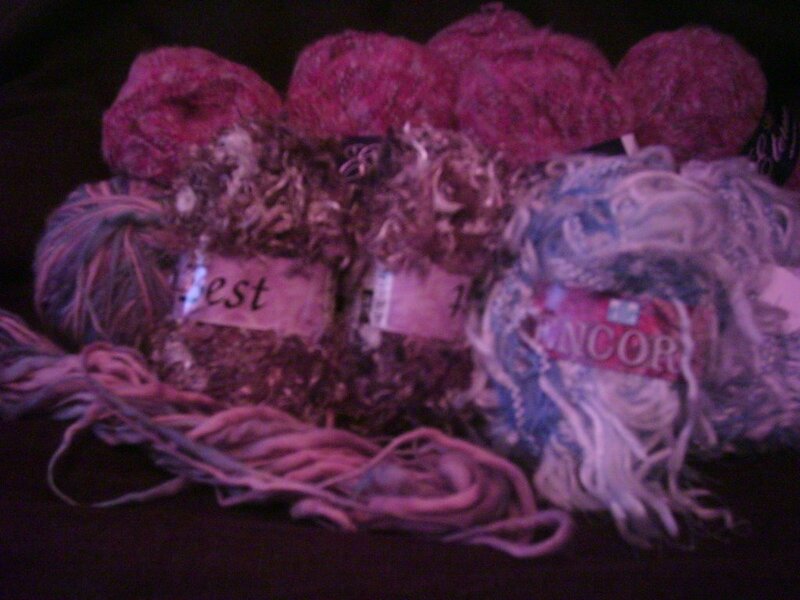 I was very good, I only bought 4 lots of wool (and 3 are for scarves) and one length of fabric. I also got a pattern for the new patons moonglow but I will get the yarn from Mrs T when I have finished knitting up some of my stash. The aran has arrived for my Rogue hoody but I am not allowing myself to start it or I will not finish the 'make it month' baby jacket. I have only done the back, one front & half a sleeve of the jacket, so must resist starting anything else, except maybe trying out the colinette. 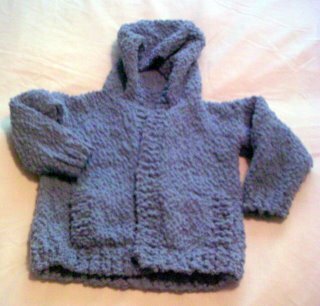 After knitting on larger needles for the last few projects, this baby jacket seems to be taking ages to grow. After one week I am only halfway up the back. This is the pattern for the Snuggly Bubbly Jacket I am planning to complete for September's make it month challenge.